What is the Windows.old folder and how to delete it. The Windows.old folder is created during the upgrade of Windows from a previous Edition to another (e.g. when you upgrade your system from Windows 7 to Windows 8.1 or from Windows 7/8.1 to 10) or when you update Windows 10 with a newer build (e.g. the "Creators Update V1703" or the "Fall Creators Update v1709"). The "C:\Windows.old folder", contains all the Windows system files and in some cases may contain all your personal files and settings from the previous Windows installation. The reason of the existence of the Windows.old folder, is to give you the opportunity to go back Windows to the previous installed version (or build) if you are experiencing problems with the newest version. It is safe to delete the Windows.old folder? As I said above, the Windows.old folder, apart from the Windows system files, may also contain your personal files and settings and for that reason it's better to keep the Windows.old folder for a while, until you make sure that your system, after the upgrade, is working without problems and the Windows.old folder does not contain useful files for you. This tutorial contains instructions to easily remove the Windows.old folder from your disk after the upgrade. 1. Leave Windows.old folder on your system for one or two weeks, until you make sure that the latest version of Windows is working properly. If not, then restore Windows 10 to the previous version. 2. Explore "Windows.old" folder contents and see if it contains important files for you at "C:\Windows.old\Users\" directory and its subfolders. 1. In Windows Explorer right click at "Local Disk disk (C:)" and select Properties. 2. Click the Disk Cleanup button. 3. 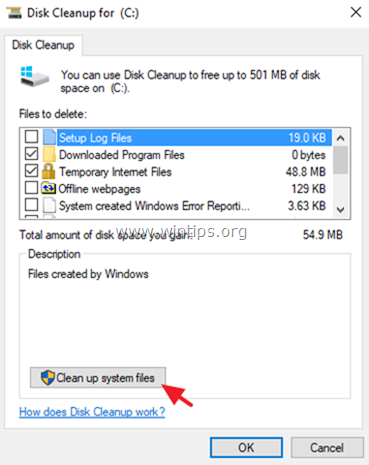 At "Disk Cleanup" window, click Clean up system files. 4. Check the Previous Windows Installations checkbox and click OK.
« FIX: Cortana Search Returns No Results (Solved)	» How to Install Windows Server 2016 Step by Step.